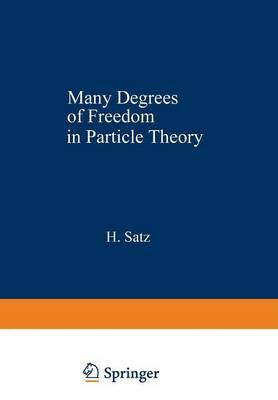 Volumes 30 and 31 of this series, dealing with "~1any Degrees of Freedom," contain the proceedings of the 1976 International Summer Institute of Theoretical Physics, held at the University of Bielefeld from August 23 to September 4, 1976. This Institute was the eighth in a series of summer schools devoted to particle physics and organized by universities and research institutes in the Federal Republic of Germany. Many degrees of freedom and collective phenomena playa critical role in the description and understanding of elementary particles. The lectures in this volume were intended to show how a combination of theoretical prejudices and experimental results can lead to the crys- tallization of models and theories. Topics ranged from quark, parton, and bag model~ to du~l unitarization, from cluster pictures to hadron-nucleus collisions and to astrophysical implications. The Institute took place at the Center for Inter- disciplinary Research of the University of Bielefeld. On behalf of all participants, it is a pleasure to thank the officials and the administration of the Center for their cooperation and help before and during the Institute. Special thanks go to V.C. Fulland, M. Kamper, and A. Kpt- tenkamp for their rapid and competent preparation of the manuscripts.